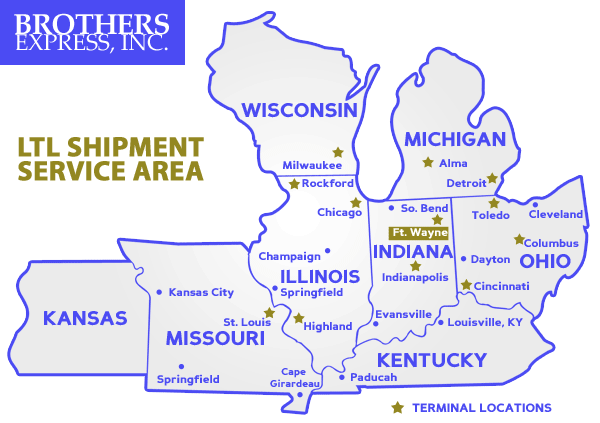 LTL Shipments from Brothers Express, Inc. - Brothers Express Inc.
LTL Shipments from Brothers Express, Inc.
At Brothers Express, Inc. we deliver Loads of Service. And if that load happens to be a little Less than a Truckload (LTL) we are still here to make sure your shipment gets to its destination on time and without hassles. Our professional, well-trained personnel are always willing to help anytime with LTL Service to 8 states. If you would like a rate quote for LTL Services, please visit the LTL Rate Quote Page. The following states are currently being serviced by Brothers Express Inc. for LTL Shipments.